I used to love getting a tin of shortbread cookies from…well, someone each Christmas when I was growing up. There were always the traditional printed shortbread cookies and the sugar crystal-crusted ones. 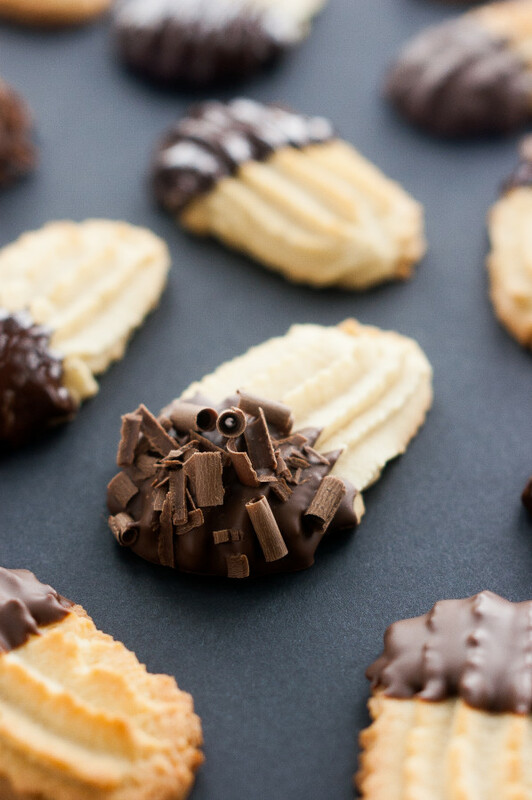 But is seems like there were also crisp, swirly, butter cookies that looked oh-so elegant with their golden ridges. 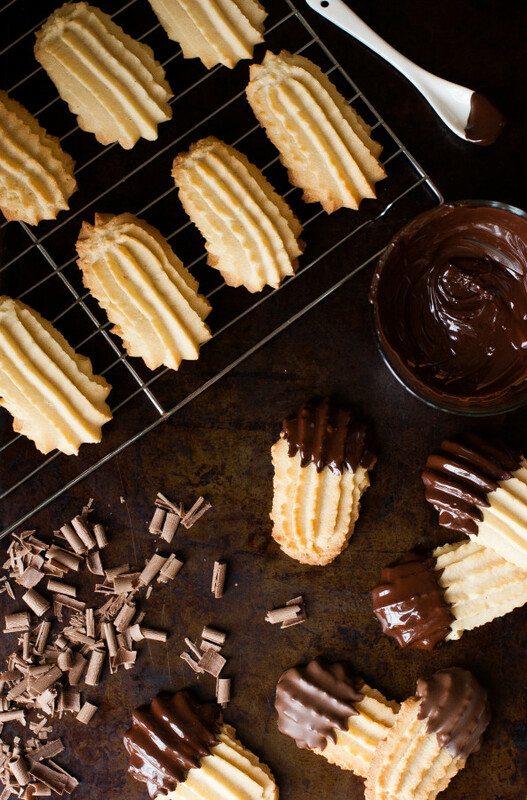 These Chocolate Dipped Italian Butter Cookies remind me of those cookies. 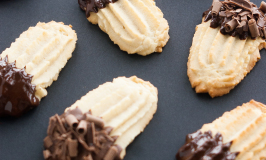 These cookies are like a very sturdy shortbread, with an extra crisp texture that goes so nicely with a dipping of chocolate. I used both regular and powdered sugar to give it a texture that is crispy, but not overly crunchy. You will need a little muscle to pipe these out, but it’s not too hard. Pipe little fingers like these, or get fancy and make circles or swirls. Anything you want. Just don’t make them too large and keep them uniform in size so that they cook evenly. Wouldn’t these make such a pretty gift? These are definitely making it onto my Christmas cookie gift plates. Make them really special by using a high quality dark chocolate. 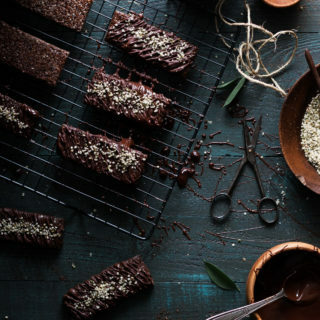 Regular, easy-melt chocolate bark or wafers will work great too. 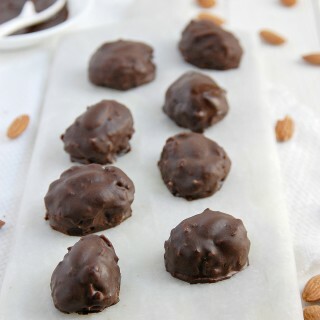 And if you wanted to, you could get crazy and dip the chocolate coated cookies in sprinkles or chopped dried fruit. Or nuts. Whatevah. You’re the boss. 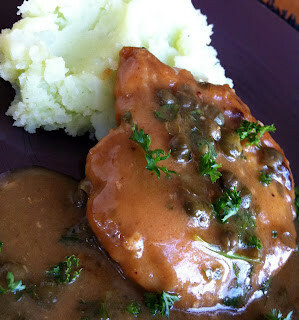 *If the dough seems to stiff to pipe out, add a few tablespoons of milk to the dough. Serves: Makes 2-3 dozen cookies, depending on how large the cookies are made to be. Preheat oven to 350 degrees. Line two baking sheets with parchment or non-stick mats. Add butter and sugars to the bowl of a stand mixer fitted with a paddle attachment and beat until smooth, creamy and fluffy, about 3 minutes. In a mixing bowl, whisk the flour, salt, and baking powder together and add to the butter mixture. Mix together until just combined. Scoop dough into a large piping bag fitted with a large star tip. Pipe strips of dough out onto prepared sheets. 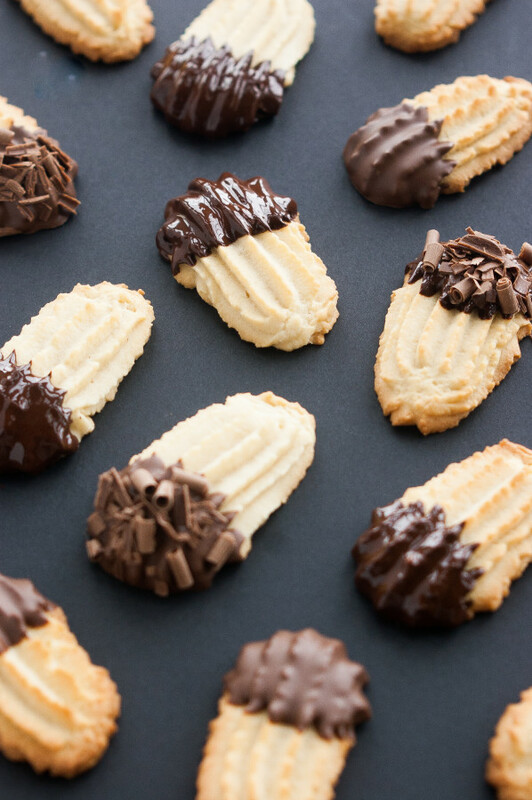 To make them as pictured, tilt the tip down while piping it out and slowly bring it to a 45 degree angle as you pipe,so that the tip of the cookie is slightly curled under. Bake cookies for 10-12 minutes or until the edges just look golden. 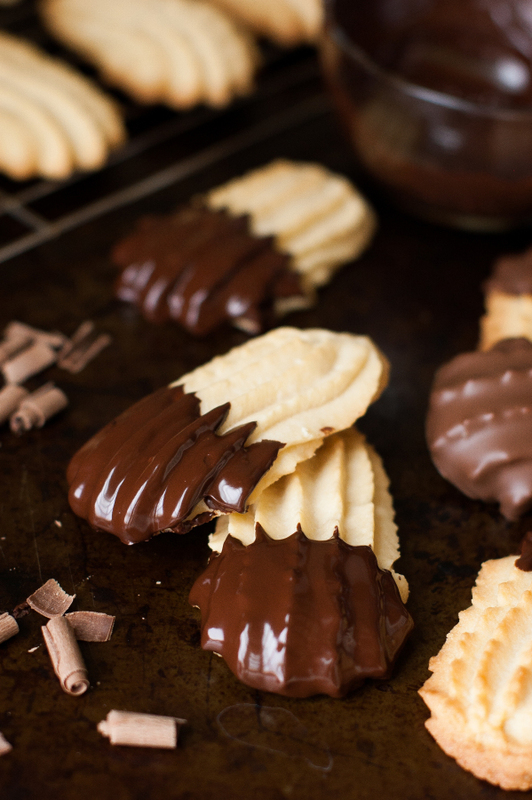 When the cookies are cool, dip the tips in melted chocolate, and place on parchment paper to set. 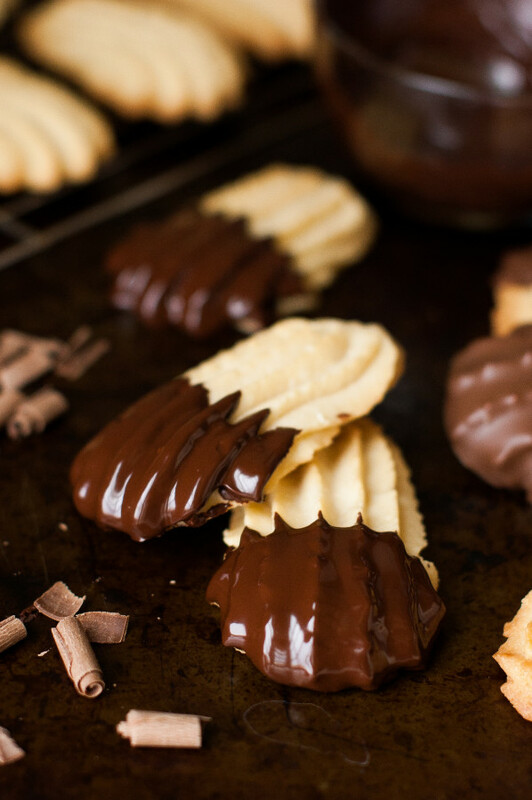 Sprinkle chocolate curls over the chocolate dipped cookies, if desired, but make sure to wait until the chocolate is no longer warm, but has not hardened.